When you talk about true Hollywood stories, Curious George might not be the first obvious candidate to offer up a whirlwind legend rife with scandal, intrigue, and worldwide fame, but the truth of his long life - he’s more than 75 years old! - would make any Vh1: Behind The Children’s Book Series episode an instant hit. In 1941, this inquisitive little monkey friend made his first appearance in H.A. Rey’s children’s book, “Cecily G. and the Nine Monkeys”. Then known as “Fifi”, the little rascal lit up the page and stole the show from Cecily G. the Giraffe, earning him his own series (reports say that Cecily can now be found busking at the Paris zoo for wine money, telling anyone and everyone who will listen how she could have had it all, if only it hadn’t been for that upstart monkey). Renamed Zozo at first because Ray didn’t want to seem rude by seemingly naming a monkey after then-King George VI (that would be the current Queen Elizabeth's dad), Curious George finally came into his own after Rey and his wife Margaret fled from Paris, France on homemade bicycles during the war. Lucky for us, one of the five in-the-works manuscripts they took with them was the first Curious George book. Which makes George's love of his bicycle a little more poignant, yeah? Since then, Curious George (or just George, if you’re British) has taken over the world with 30 million book copies, translated into 16 languages. Pretty amazing, right? Even better, now your child can carry on that fantastic legacy of monkey'ing around with this Toddler Curious George Costume! 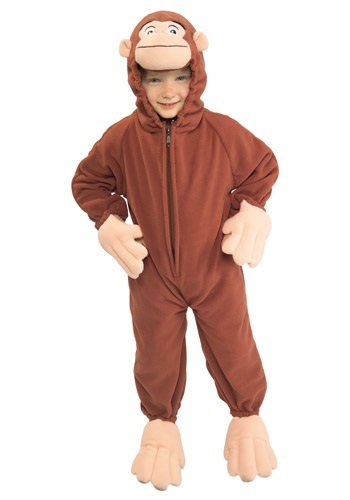 This super cute and cuddly costume will let your little one get into all sorts of adventures, and they'll look so adorable that you won't even mind the mischief they make!